Ibiza is the third largest and most westerly of the Balearic Islands located off the east coast of Spain. In terms of its popularity as a destination, Ibiza is a blockbuster and really needs no introduction. Getting there by sea involves getting a ferry from mainland Spain or one of the neighboring islands. Ferries depart from Barcelona (north of Ibiza) and Valencia and Denia (from the west). The majority of ferries dock at Ibiza port in the south, though you can also sail (less frequently) to San Antonio port in the North west. Crossings generally take between four and nine hours depending on the route and are operated year round by both Balearia and Acciona Trasmediterranea with increased frequency during high season. The Inter-island crossings from Formentera and Palma Mallorca are popular too. The short trip from Formentera takes just thirty minutes while the crossing from Mallorca is longer at around three hours. Beside its pleasant climate, Ibiza is perhaps best known for its prolific nightlife and is home to some of the world's most famous nightclubs including the likes of Pacha and Amnesia. Many of today's biggest DJs made their name in Ibiza, with the summer party season attracting all the VIPs of dance music. Despite being renowned for its thriving party scene, Ibiza is a charmingly child-friendly environment, so don’t be afraid to take the family! However, it's not just the superstar DJs and eager ravers that make Ibiza the place to be, the beautiful island is scattered with quaint villages, stunning beaches and a spectacular food scene. Once a year, Ibiza is host to Saboreando Octubre (Tasting October), which is all part of raising awareness of local produce. If you’re not in town for the food festival, there's still plenty to celebrate in Ibiza's restaurants; Ibiza is most known for its seafood dishes, so prepare for some perfect paella. All in all, Ibiza is a very well connected island, perfect as a vacation destination in itself or a wonderful place to stop off for a few days if you’re in Spain or touring the Balearic Islands. For more information, please visit our Ferries from Formentera to Ibiza page. 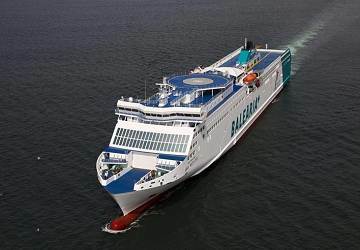 For more information, please visit our Ferries from Mallorca to Ibiza page.